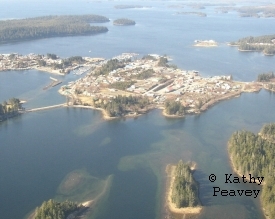 Prince of Wales Island (POW) is unlike much of the rest of Southeast Alaska. It has almost 1,000 miles of shoreline, and at 140 miles long by 45 miles wide is the third-largest island in the United States behind Kodiak Island and Hawaii’s Big Island. Twelve friendly communities are scattered around the island, ranging in population from over 1,000 (Craig) to about 35 (Point Baker). Exploring the island is relatively easy, due to an extensive system of both paved and unpaved roads. One thing Prince of Wales Island does have in common with the rest of Southeast Alaska is an abundance of wildlife. Black bears fish for salmon in streams and creeks, and wander the island’s beaches, forests and roadways. Sea otters feed on shellfish while wrapped up in kelp beds. Sitka black-tailed deer can be seen almost anywhere, with good viewing on or next to the roads. Humpback whales, Steller sea lions, harbor seals and a variety of sea birds come to feed in the nutrient-rich waters around the island throughout the summer. Plan to spend most of your visit to Prince of Wales on your own, as much of the island remains largely undiscovered by tourism. To help you get started, we’ve included some of our favorite wildlife viewing sites, but there’s much more waiting to be discovered. For information on tours and lodging, consult the Prince of Wales Chamber of Commerce. Visit their website at http://www.princeofwalescoc.org or call (907) 755-2626. On the island, visit their office next to the grocery store in Klawock.